I find many people complaining about the six-month release cycle Ubuntu follows. What these people tend to overlook is the fact that Ubuntu releases an LTS, long-term service, version every two years. The LTS version has a longer support and is intended to be more stable than non-LTS releases. Unless you want the latest and greatest features Ubuntu has to offer, you can stick with the LTS release for 3 years while still receiving updates. A six-month release cycle can benefit any Linux distribution because it forces the developer to have a continuous goal to work towards and gives wanting users a new feature set in a fixed interval. Users not wanting the latest feature set can keep their version for the three year period it receives updates and aren’t forced to upgrade to the latest release. I found an envelope with four Powered By Ubuntu stickers in my mail courtesy of System76. The first thing I did was remove the Designed for Windows XP sticker from my everyday computer and replace it with an Ubuntu sticker. 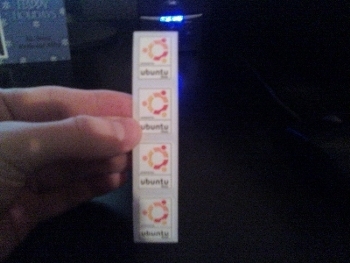 If you would like your own Powered by Ubuntu stickers then simply go here. All you need is two stamps and two envelopes. In order for people to switch to Linux they must have an inner desire to do so. When I first found out about Linux I thought, “Wow, this is great! I should tell everyone about this!” I’ve since come to realize that many people are satisfied with Windows simply because it works for what they want it to do. 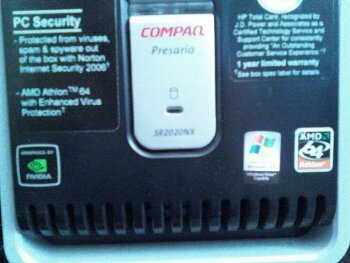 It doesn’t matter if it is infected with viruses while they do it; just as long as it does what they want done in a timely fashion, they are satisfied. There is currently a new copy of Kameo selling for $13.49 on Amazon. There is also a “collectible” copy selling for $29.98. 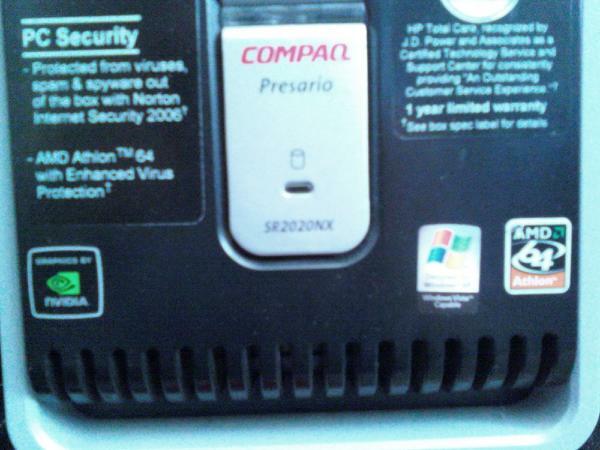 The collectible copy is the same as a new copy, but it is being sold for more money. Selling collectible copies of games makes sense when the game at hand is scarce or at least from a previous generation of consoles, but Kameo is a three year old game from the current generation of consoles. Collectible copies shouldn’t be sold if there are still new copies of the game being sold. I’m just wondering if anyone is actually dumb enough to buy the “collectible” copy instead of the new copy when they are the same exact thing. Are Video Game Instruction Manuals Obsolete? I recently picked up a copy of Prey. When I removed the packaging I noticed that the instruction manual was bent at the bottom right corner. This got me thinking, “Why do publishers even bother including instruction manuals?” I remember reading through the instruction manuals of all my new games on car rides home when I was a kid. It was a good way to find out the controls, the story, and get a good feel of what the game was all about. Instruction manuals had a lot more weight in the infancy of video games. They weren’t just a set instructions; they were the way you found out the controls, the story line, and all the features the game had to offer. Manuals had much more importance up through the 8-bit era, as many systems didn’t have the resources to do in-game what the manuals could accomplish. The instruction manual was no longer the only way developers could tell the story or introduce the game’s controls once the Super Nintendo and Genesis were released. It has become more feasible to have cut scenes explain the story and have an introductory level explain the controls as consoles’ technologies have improved. Also, bestiaries and galleries are commonplace as unlockable material in many games today, as opposed to previously only being available in the game’s manual. Video game instruction manuals may not be obsolete, but they have definitely lost much of their importance throughout the years. They seem to be an artifact of gaming’s past, but will always have a small role in video games. After all, I would feel a little bit ripped-off if I opened a brand new game only to find a lone disc inside. You may have an mp3 player that is already filled with music or may be nearing the storage cap. I have a memory stick for my PSP with only 512 MB of storage, with around 100 MB of which being taken up by game-related files. Being able to store as much music on my small memory stick is pretty important to me. I’ll show you how to decrease your music files’ size to maximize the amount of songs you can fit on your mp3 player. After Audacity is installed, open your desired music file in Audacity by opening Audacity, clicking File >Open, and selecting your file. Once your file is open in Audacity, click File > Export. Above the Save and Cancel buttons, there will be a choice called “Options.” Click Options and you will be presented with a few choices: Bit Rate Mode, Quality, Variable Speed, and Channel Mode. The choice we will be concerned with is Quality. You will notice that under the drop-down menu for Quality there are numbers in increments of 8 to choose from. A higher kbps number results in a larger file size with higher quality, while a lower kbps number means a smaller file size with lower quality. The typical kbps number is 128 for many songs. 128 kbps leads to a fairly even ratio for file size and file length. Every minute of a song adds around 1 MB to the file size. For example, a 3 and a half minute song will be around 3.5 MB; not exactly 3.5 MB, but it is a fairly good estimate. I have found that changing my quality to 96 kbps leaves my file close to half its original size while still keeping its quality in tact. I changed a 4.3 MB, 128 kbps file to a 2.4 MB, 96 kbps file. I saved myself 1.9 MB on my PSP. When you do this to all the music on your mp3 player you can easily find yourself being able to increase the amount of songs on your device by 25%. I’ve been playing Super Mario: The Lost Levels for the past week and I’ve loved every second of it. Some of the levels have individually taken me a couple hours to complete on their own; not entire worlds but single levels (ie 4-4). So now I’m on world 8, which I’m assuming is the last world, and I am now stuck on the first level. 8-1 shouldn’t be any harder than the other difficult levels; it has an area where there are two Bullet Bill cannons, followed by a Buzzy Beetle, followed by a Red Piranha, followed by a Hammer Brother. This area isn’t impossible, it just takes precision to dodge all of the enemies and attacks. 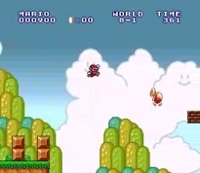 The area directly after, however, is where the player must make a running jump over the below abyss and land on a Red Koopa Paratroopa in order to make the extra distance to land safely on the next patch of ground (as shown in the below screenshot). This would seem easy enough, the player just has to jump at the last possible moment in order to reach the Koopa, but the Koopa pattern isn’t predictable at all. It is impossible to see the Koopa before making the blind leap. Once you jump, all you can do is hope the Koopa will be in place for you to land on it but this doesn’t happen often enough. Most times I have found myself just falling to my death. I have tried approaching the edge before stepping back and running to the jump hoping this will trigger some predictable pattern, and I have equally tried just running up to the edge and immediately jumping; either way, there is no sense of predictability as to where the Koopa will be when he appears on screen. This scenario isn’t difficult, it is terrible game design. Making the player blindly jump to an unpredictible target is too much to ask for. I prefer the outcome of a video game I’m playing to be determined by my skill, not my luck. It is comparable to bad camera angles in today’s 3D games. This one area isn’t enough to ruin what has been a great experience thus far, but I just hope the rest of the game doesn’t pull out cheap design to maintain the difficulty. I thought this project was horrible. It is like trying to condense something as open ended as “Grand Theft Auto: San Andreas” onto a “Nintendo Entertainment System” cartridge, if you understand what is meant by that analogy. You can’t try to make life into a project; there is an infinite amount of conditions to each of the choices to be made in this project. I can understand why a teacher would want to assign this to a student; “to prepare them to use their money in a mature manner”. This project doesn’t prepare us for the real world; it just sharpens our math skills at best. I can assure you that everyone that ended the final month with a positive amount of money had either A) had a credit card balance that would continue to rise past the first year, and would eventually bring them to bankruptcy, or B) they cheated by making decisions based on knowing the outcome of that decision. Many people probably bought plenty of stocks knowing that they could sell them to get a large profit. There are all my assumptions, and other people might have a greater rollover amount. If they were given my preliminary budget, they would not be able to pass the final month with a positive amount of money. This is about two and a half years old now. The project was a simulation of the year after high school, assuming the participant didn’t go to college and started working right after graduation. This portion is from the reflective essay on how I felt about the project. I just found it funny how I compared the project to putting San Andreas into an NES cartridge. Don’t you just hate when people overreact to lights being turned on in a dark room, when they act like they are vampires being thrust into sunlight? I do. Maybe I just have super powers that enable me to withstand a change in lighting without making odd moans and groans? 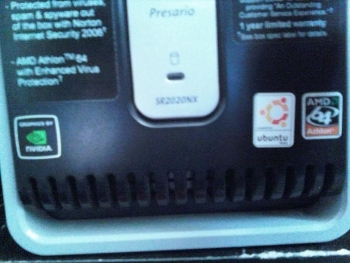 The main thing I hated about Ubuntu was the fact that I could only have one application using sound at a time. I’ve been using 8.10 for a week now and I just noticed that I was watching YouTube videos in Firefox and listening to music with Totem at the same time, something I’ve never been able to do in previous versions of Ubuntu. It’s one of those things that is so important in an OS that most people don’t even notice it until it’s gone. I hadn’t even noticed it was fixed until a week after I should have noticed, after all. So if you haven’t made the switch to 8.10 and multiple applications using sound simultaenously is important to you, I would suggest upgrading.